Frankincense is truly an amazing resin. Last week I told you what frankincense is, where it comes from, and how almost two hundred studies to date have shown that it is highly beneficial to the human body: Frankincense Benefits and Types. The next question is, of course, what are the ways to use frankincense? What methods are safe? When studies say that it removed joint pain and greatly reduced other types of inflammation, in what way was it used where it was shown to be effective? You need to know how to make frankincense extract oil, as well as how to use the powder and tears in order to use frankincense extract oil for pain, anxiety, depression, or even cancer tumor reduction. 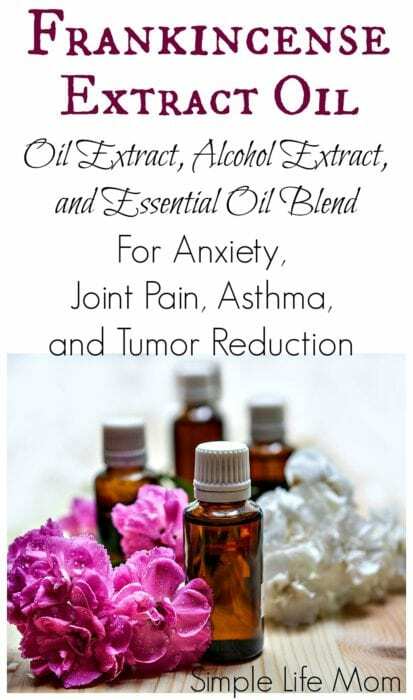 This Extract Oil can also be found in my shop with extra frankincense and myrrh essential oils added. That’s quite a list! How is one resin able to do so much? It mainly focuses on reducing inflammation and regulating white blood cells and T-Cells. This, in turn, impacts a number of conditions and diseases that are triggered by inflammation and a poor immune system. Powder, Sap, Extract, or Essential Oil? What’s better, the frankincense tears (sap), resin that has been ground into a fine powder, an extract (frankincense oil and resin extracted through light heat into an oil), or frankincense essential oil? They are all fabulous, but you will choose different forms depending on what you want to use it for and your method of use. Reminder: Frankincense is about 65% gum (water soluble), 30% resin (alcohol soluble), and 4% essential oil (oil soluble).1 Boswellic Acid (the key component for cancerous tumor reduction) is found in the resin and is not volatile enough to become an essential oil. Frankincense essential oil is the one essential oil that I use almost daily, but it doesn’t contain boswellic acid. It is super valuable without it!! But you may also want to use another form in order to also utilize the gum and resin. Caution: Frankincense powder can be taken internally, but you need to talk with a naturopathic doctor first. For example, I have read that it interferes with some medications (like blood thinners), and it shouldn’t be used in high doses within the first trimester of pregnancy. If you don’t live near a naturopathic doctor, you can often call and they will answer questions over the phone. Starwest Botanicals has been producing fabulous products since 1975 and are 3rd party tested for purity. I’ve given links below to help you find some of the ingredients. I’ve bought frankincense resin powder from a few companies and have been very happy with it. It is bitter to taste if simply added to..tea, for example (though some people like it), but it is wonderful placed in capsules. Some use 200mg per day to battle arthritis pain and other internal inflammation issues, as well as cancer. Sap droplets are called frankincense tears. These can also be purchased online these days: Here. 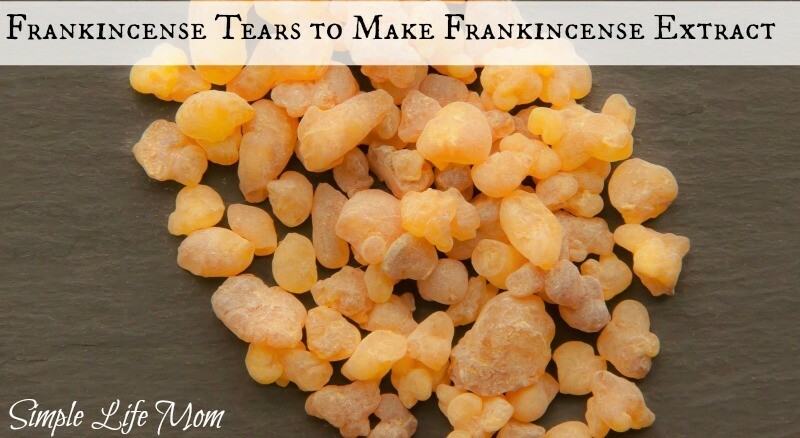 The Frankincense tears can be ground down to a very fresh powder and used in that way, or can be used to make an extract. You can carefully place a frankincense tear on a hot charcoal and use it as an incense. Clean burning coal can be found HERE. You don’t have to buy a burner, but they also sell those. You can simply place it in a cast iron pot (it will get hot so make sure you are setting it somewhere safe, like on your cold stove). Light it, and when it is hot carefully drop a tear or place a tear with tweezers onto the coal. You can place one or two tears in boiling water and inhale the vapor to help with anxiety, stress, and even asthma. I once read a tip that frankincense resin should be frozen before grinding in an electric hand grinder to keep it from becoming a melty goopy mess. It’s true and makes the grinding a lot easier. It must be kept airtight after grinding, otherwise it’s like brown sugar and will absorb moisture and become like a rock. The purpose of an extract is to extract valuable properties of a plant so that they are more easily consumed. Since a few of Frankincense’s valuable components are not present in the essential oil, it’s great to know how to make an extract as well. You will be able to dissolve about 40% or so of the frankincense in oil (the oil and resin). The rest will be the gum. I like an oil extraction because you can rub it all over the body. Combine 1 Part Frankincense powder to 2 parts jojoba oil in a jar (Jojoba often lasts longer than other oils because it's technically a wax). Place in a pot of simmering water and let simmer for 2-3 hours, stirring occasionally. Pour through a sieve or cheese cloth, pressing with a spoon to make sure you get as much of the oil as possible. You may need to let it set for a day and pour off again, leaving sediment behind. Add a few drops of rosemary essential oil or pure vitamin e oil to help preserve the oil. Talk to your doctor, as frankincense may possibly interfere with some medications. If he or she says it is ok, I have taken this extraction with food (1tsp once a day) with success and have friends with serious joint pain who do so and have experienced great results. Otherwise, use externally on painful areas as many times as you see fit. Listen to your body. With vodka you will gain a higher percentage of yield from the Frankincense. Even the water soluble gum is extracted to a degree, making this a stronger tincture. Again, you must decide whether to make an alcohol or oil extraction based on how you want to use it – or make both 🙂 . Combine 1 Part Frankincense powder to 5 Parts Vodka. Close the lid and shake. Shake once daily for 8 weeks (It can last indefinitely if you forget it for a while). Sift through a cheese cloth or coffee filter and it's ready for use. You may need to let it settle for a day or so and re-sift, but I usually don't worry about extras on the bottom. Talk to your doctor, as frankincense may possibly interfere with some medications. If he or she says it is ok, you may use this in tea or coffee, 1 tsp. at a time. Pay attention to your body. Essential oils can be used neat (undiluted), but it makes sense to dilute essential oils so that the oil covers a larger area of the body and is more readily available to soak into the skin. Evening Primrose oil is known to help reduce inflammation, but it goes bad very quickly. Keep in the refrigerator to help preserve the oil. OR apply 6-10 drops to chest to help relieve anxiety or asthma. Use your head, share this with others, and let me know if you have any questions. When you took the extraction, 1 tsp with food, what kind of oil were you using? I have a friend who suffers with RA, would he benefit most by consuming frankincense or by rubbing it on his skin? Do you think a person gets very much pain relief by using it topically? The reason I’m asking, I’m not sure he can consume it with his medication. I’m going to make some if noting else for myself as a topical application. I’m excited to try it, thank you so much! I have very bad joint pain that my doctor is still trying to figure out. In the mean time, applying this topically to my joints give me a lot of relief. On my worst days it will give me 2 hours of relief before I need to reapply. On better days I can apply once or twice a day and feel great. Internally, you can make this and take 1 tsp per day. I would recommend grinding your own tears, as often powder that you buy can be extra bitter. It works very well both ways from my experience. Thank you for the reply and I’m sorry about your pain. I had rheumatic fever as a child and a side affect of what they called juvenile arthritis that didn’t go away when I was grown up so I understand pain and inflammation. For years I just accepted that there was nothing I could do and took something for pain but after awhile I decided there had to be things that would help. I was also having a lot sinus problems due to allergies, I heard a woman say that if you have allergies you should try giving up red meat so I did that. It helped with both my allergies and the inflammation but it didn’t fix the problem. The next thing was a good liquid fish oil. I took that for a few years with some good results. Eventually I couldn’t drink milk or dairy so I gave that up, I gave up poultry so I was getting to the point of not much left. Then, I started eating extra virgin unrefined coconut oil which seemed to help me more than anything. I also swish it (oil pull) for sinus and have gotten good results from that. I started making and drinking wheat grass juice, eating local eggs and raw goat milk. I’m just telling you this in case any of it seems that it might help you. I know that now I have very little arthritis pain and I feel better than I have in years. There is a reason you’re having the pain and it may take trial and error to fix it but you will. I am also making and using infused frankincense oil, calendula oil, comfrey oil and chaparral oil. They all seem to help something and they are great and fun to use. Sorry for the long post but tank you again for sharing your information and best wishes to you. 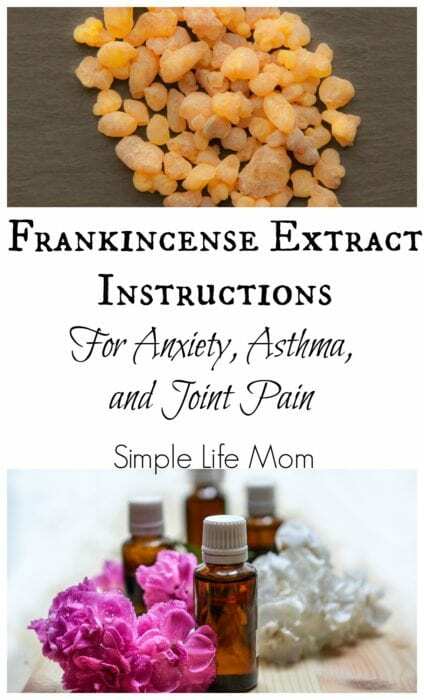 Thank you for this article on how to make Frankincense extract and oil. I use it as incense, and I also dilute the essential oil in a good carrier oil. I’ll have to try making my own extract now! P.S. I use the diluted essential oil under my eyes and on my smile and frown lines! I do too! It’s amazing! Hi Kelly, I love your website and your recipes too. I use your eye cream and serum religiously, actually, I make it, and my entire family uses it and some friends to and they love it. It works well for reducing lines and keeping your skin fresh and young and radiant. I’m so excited to have found this information to help with arthritis. I am going to make the recipe tomorrow for my husband and mom. I have a question, I have been making your shea butter body butter but seem to have a problem with it not dissolving. so it’s gritty. How can I improve on this? It sounda like the quality of Shea you arw buying. It’s hard buying raw shea. Most of the time mine is smooth, but then I’ll get a batch that is grainy. There’s nothing you can do if just whipping. You can melt it gently and let it cool fully. If it’s warm it won’t whip nicely. One more question, what does the frankincense oil do for under your eyes? I’ve only just found this site,as an essential oil convert I sure frankincense oil for everything but I use coconut oil as a carrier “”is this ok””!!!! But want a fantastic site,so much info and guidance,I love love it,!!!!!!!!! Yes, coconut oil will be fine.